Bread pudding for two: I’m working with HERSHEY this holiday season to bring you some desserts for two using their products. I’m so happy to have them in my kitchen this baking season! You probably already know two things about bread pudding: it’s delicious and everyone loves it. It’s a mainstay on restaurant menus for a reason. But maybe there’s something you don’t know about it: the absolute ease with which you can make it. Anytime, anywhere. Leftover bread, fresh bread. One egg per serving that you want to make, and a splash of milk and sugar. Are you on board yet? If so, grab two coffee mugs and let’s get to work. Easy enough, right? These are things we always have on hand, you too? The formula above is for each mug, just to be clear. Four easy steps! You can do this! ‘The baby went down for a nap!’ —grab a victory chocolate! ‘The dogs didn’t bark and wake up the baby when the mailman came’ —grab a sigh-of-relief chocolate! ‘I dropped my kid off for daycare with matching socks’—grab a celebratory chocolate! ‘I have no plans for dinner and it’s 6:00’ — distract self with chocolate. ‘The baby woke up 2 hours too early from her nap —hurriedly eat chocolate. ‘Work is piling up and baby wants to be on my hip 24/7’—eat chocolate with baby. 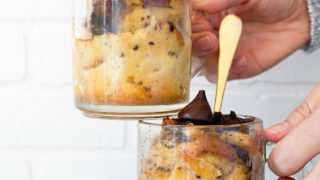 If you can spare some chocolate from your pantry, you can have two mugs of warm, comforting bread pudding for two. As soon as this comes out of the oven, I wrap a thick towel around the hot mug and head to the couch. Wait, I should mention the first thing I do when this comes out of the oven. It’s the best part—I unwrap another KISSES Chocolate, press it into the warm surface and watch it melt over the top. Don’t forget that step! You can make these in two oven safe coffee mugs, or two ramekins; whatever you have. You can bake these in the oven for 25 minutes, or you can plop them in the bottom of your slow cooker with an inch of water and cook on LOW for 2-3 hours (remind you of my slow cooker bread pudding recipe?). 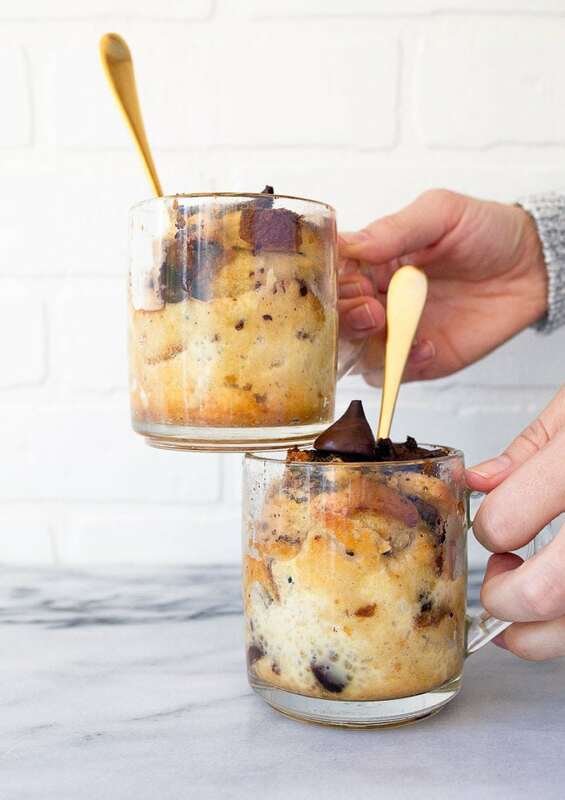 Chocolate bread pudding made in two mugs. Spray two 8-ounce coffee mugs (or small ramekins) lightly with cooking spray. Dice the bread into 1” pieces. 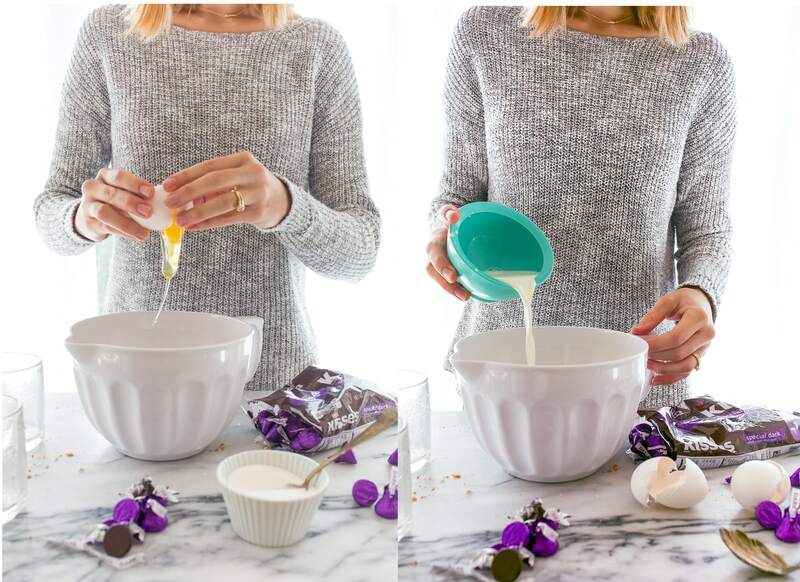 In a small bowl, whisk together the eggs, milk, sugar and vanilla. Using a very sharp knife, carefully chop 8 of the HERSHEY’S KISSES. 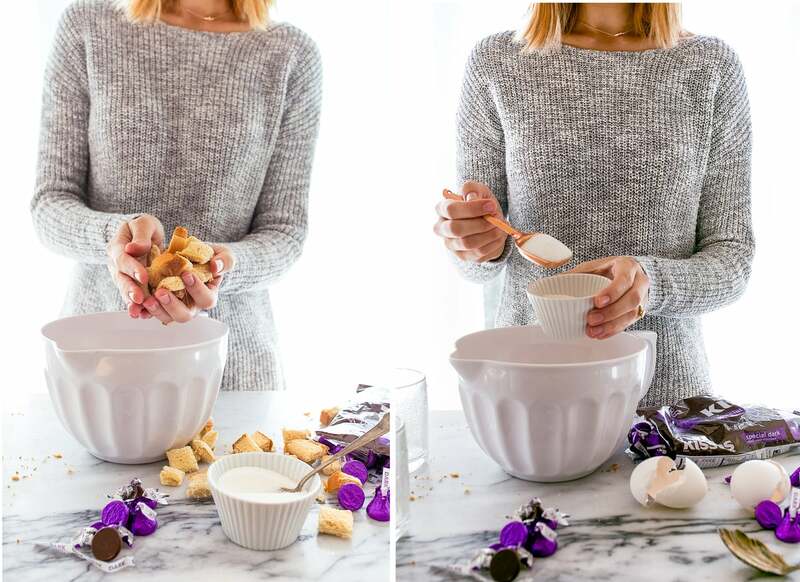 Add the bread and chopped KISSES to the bowl with the eggs and milk. Stir very well to combine. Divide the mixture between the mugs. Place the mugs on a small baking sheet, and bake for 25 minutes. The mixture will puff up and rise when you remove it from the oven. 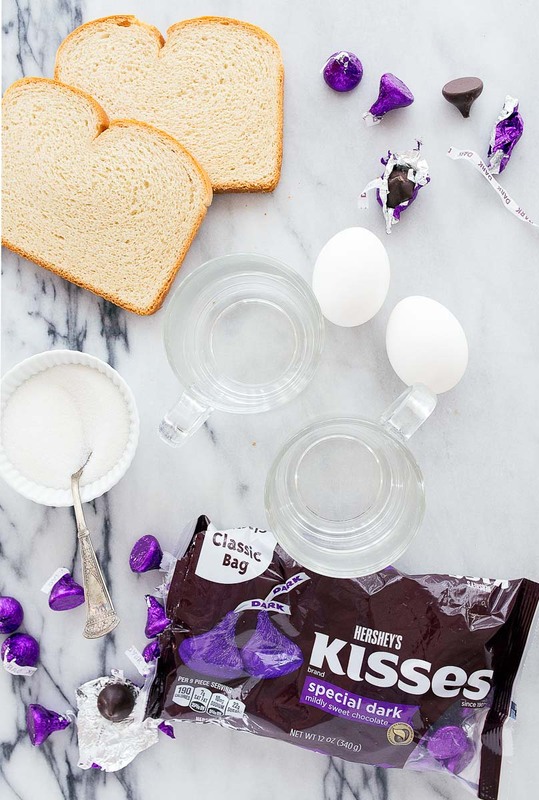 Right when the mugs come out of the oven, top each with the remaining HERSHEY’S KISSES, and let melt slightly before serving. Serve wrapped in a towel because the mugs are quite warm. OH GIRL. The south that resides within my genetic code loves (loveslovesloves) that you just gave me the keys to the single serving bread pudding kingdom. HOLLA. Love this comment! Southern girl! That sounds like the best idea ever!!! Ohhhh, bless your heart! Love some bread puddin. I’d substitute the chocolate for raisins and a sprinkle of cinnamon or use leftover fruit bread! Can these be cooked in the microwave? No, I’m sorry, I didn’t try them that way. Oh my!!! This sounds amazing, I will be trying for sure. Happy Thanksgiving.???? hey girl this looks really good! I think you like chocolate as much as I do! Ha yummy! I’ve only had bread pudding icy cold. Can these be served that way? This recipe isn’t cooked in the microwave, so I can’t attest to that. This looks so yummy and easy to make. Do you think almond milk will work in this recipe? Christina, I had to tell you that I made this bread pudding using a Panettone Bread that I had left over from Christmas! I doubled the recipe and put it in a 8×8 pan. Wow! It was a big hit! So easy and so delicious! Big scoop of ice cream on top was all it needed! Thanks for such a great recipe! We loved it!! I love bread pudding , this is the first time I have every made it . Thank you for this recipe . I love the idea of individual mugs, that way I won’t be guilty of eating the whole pan!!???? Why does the recipe call for 3 slices of bread? Curiosity strikes: why cut up kisses when choc chips are already small ?~! Hi there! I have a question about the glass mugs…your link to oven safe mugs took me to a mug of a different style than the ones shown in the picture and the linked mugs were not listed as oven safe. Can I ask the brand of the mugs in the picture? Great question, Leslie! The mugs in the photos are vintage from a thrift store, and I could not link to those directly, apologies! The mugs that I linked to are the ones I used in the filming of the video for this recipe. I’m not seeing the part on Amazon about the mugs not being oven safe :( I’ve used these mugs in the oven for years without issue. 350 is a pretty low temperature, and my mugs have never cracked. I have leftover mini banana bread w/chocolate chips muffins, I would love to use these so my question is, your recipe calls for 3 slices of bread, what is that equivalent to? 1 cup? 2 cups? 3 cups? Now please can you give us a recipe for a mug cake made with honey and no sugar? and preferably with almond flour? I just tried this with mini croissants and mini chocolate chips. Turned out wonderful! Love your small batch recipes!